The Apple Earbud headphones are pretty great for a free set of earphones, and the Xbox One is a great gaming console with a controller that allows Xbox players to plug a headphone set directly in to the wireless controller, so naturally it’s not surprising that some Xbox One players would like to use a set of Apple Earbuds with the Xbox One controller, right? If you have tried this yourself, you’ve likely noticed that it works, but you get a feedback buzzing hiss sound from Earbuds that makes it basically unusable. Not to worry, there’s a solution to that buzzing sound problem! Enterprising YouTuber @NickRobinson has discovered a simple fix that allows the Apple earbud headphone set to be used with an Xbox One controller, minus the awful feedback hissing sound. 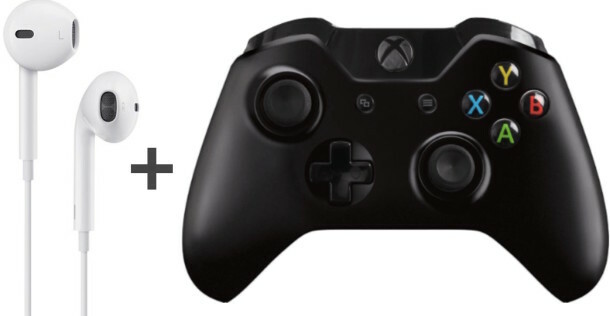 By the way, if anyone has figured out how to make this work when the Xbox One controller is connected to a Mac, then do share it with us in the comments. Curiously, if you have a PS4 controller setup with Mac OS X, you can just plug the headphones right in to that controller and they seem to work fine without any feedback issues. Anyway, thanks to @icrizzo for the heads up about this headphone trick. If you don’t turn the mic off everyone else will hear a buzzing sound except for you. Mixing MS kit with Apple kit? Isn’t this sacrilegious or something? nice one, but do u have a hint how to set it up with an ps4 controller ? You can plug the earbuds or headphones directly into the 3.5mm port on the PS4 controller too, sound comes through it fine. Still doesn’t help, it doesn’t take much to find that out on your own. My question is there a way to fix it, to be able to be use a microphone. That what I want to know too. I will sell my JBL J55i because I can`t use mic in Xbox One Control. This is awfully misleading. People come here wanting to use the iPhone headphones as a MIC and a headset, this only makes it so you can hear, not talk. This works exactly as described to use the Earbud headphones the white earphones from iPhone to plug in to an Xbox controller, works perfect. Yes, I plugged in the Apple Earpods in before I scrolled down to the gear icon, but the settings doesn’t show up. How do I fix that? I would like to know how to talk Ina party with my friends instead of hearing the game any suggestions? Same here with Antonio it won’t appear for me, can someone help me on that? I’m wondering wouldn’t it be really easy to just make an adapter for this yourself. Basically all you need to do is switch the 2 poles up. So you take a female 4 pole 3.5mm jack and a male 4 pole 3.mm jack. You connect the bottom pole from the female connector to the second pole from the bottom of the male connector. You connect the second pole from the bottom of the female connector to the bottom pole of the male connector. Plug your iphone buds into the female connector the male connector into your xbox controller and it should technically work. I’ve found if you plug a headphone splitter into the controller the EarPods don’t buzz.